Primarily made of plastic, the Bubble House prototype was first introduced in 1956 at the Salon des Arts Ménagers as a futuristic shape and innovative construction in architecture. Its author is the architect, urban designer and theoretician Jean Maneval (1923-1986). The house was finally brought into production in 1968 in collaboration with the plastics company Batiplastique. 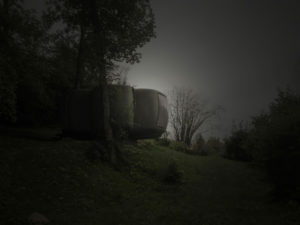 The design was later used to create an experimental holiday village in Gripp in the Pyrenees. Twenty houses were created for this mountain constellation, which thanks to their ingenious prefabrication could be quickly and easily assembled on site. A pair of art collectors let this exemplar land in a huge, private parkland directly by the river Le Doubs, in the French Jura. There it still appears as a fragment of the future. Der Bubble-House-Prototyp, der in erster Linie aus Kunststoff besteht, wurde 1956 erstmals auf dem Salon des Arts Ménagers vorgestellt und sorgte in der Architektur für seine futuristische Form und innovative Konstruktion. Sein Autor ist der Architekt, Urban Designer und Theoretiker Jean Maneval (1923-1986). Das Haus wurde schließlich 1968 in Zusammenarbeit mit der Kunststofffirma Batiplastique in Produktion gebracht. Der Entwurf wurde später dazu benutzt, ein experimentelles Feriendorf in Gripp in den Pyrenäen zu schaffen. Für diese Bergkonstellation wurden zwanzig Häuser geschaffen, die dank ihres ausgeklügelten Fertigbaus schnell und einfach vor Ort zusammengebaut werden konnten. Dieses Exemplar hat ein Kunstsammlerpaar in eine riesige, private Parklandschaft direkt am Fluss Le Doubs, im französischen Jura landen lassen. Dort wirkt es immer noch wie ein Stück Zukunft.